Happy Monday! I really hate to say this but my skin has definitely suffered after being pregnant for nearly two years in a row. With both pregnancies I failed to properly take care of it (out of pure laziness) and I was unable to use some products in my cabinet that I was used to using due to the ingredients. Now, I'm left with an uneven skin tone and some pesky melasma spots that I knew had to be my focus once I had Grayson. I wanted to make it a priority to myself to get my skin in tip-top condition again. For the past month I've been using two products to help brighten my skin and make it look healthier. I didn't have success with the first one (Neutrogena's Visibly Even Moisturizer), but I did want to share the one I'm still using and finding the best results with, which is Garnier SkinActive® Clearly Brighter™ Brightening & Smoothing Daily Moisturizer SPF 15. Garnier SkinActive® is a brand that I've used for years and I've loved many of their products so I was excited to try this. I've been using this moisturizer every morning and within a week I noticed a difference in my skin. It claims to even out tone and texture for brighter, smoother skin and it did just that. My skin has felt so much more hydrayed. healthier, and it's oil-free formula so I don't have to worry about breaking out. My melasma and dark spots are fading away so I know that by continuing to use this product these trouble areas will look even better. Another reason why I love this moisturizer is because it has antioxidant Vitamin C in it, which is so beneficial for your skin. For a mom that has very little time to take care of herself, using this product has been simple enough to give me results I want without breaking the bank. Highly, highly recommend you give it a try if you've been neglecting your skin like me! You can find this moisturizer at Target, Walmart, Amazon, CVS, Rite Aid, etc! Head on over to Garnier SkinActive®'s website, Facebook, Twitter, Pinterest, Instagram, YouTube, and Google+ to learn more about their products. For a chance to win a $100 Visa gift card, tell me: what is one step in your beauty regimen that you never skip? Your comment will enter you to win! I skip parts of my skin regimen, all the time: I may not use sunscreen daily, may not moisturize, I am not consistent. 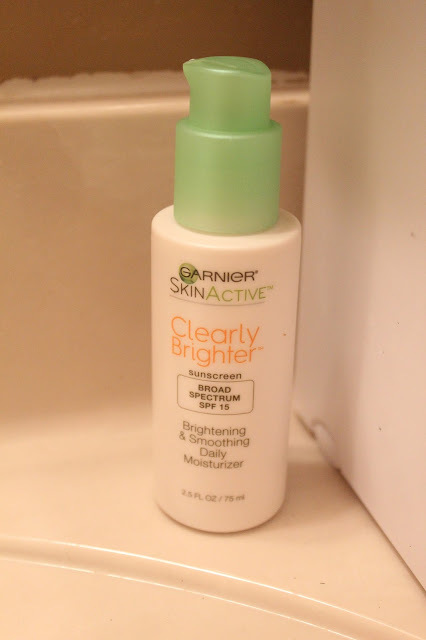 I need to get this Clearly brighter product. I have uneven skin tone. But the skin regimen that I do all the time is to make sure to moisturize my skin and clean it every night!! I love this moisturizer! I use it everyday! I can't imagine using anything else. Most definitely would have to be moisturizing before putting on any makeup. I always moisturize but I could definitely be better about the rest! I never go to bed without washing off all of my make up. If nothing else, I ALWAYS moisturize!! I use micellar water every day to get the makeup off. I always wash my makeup off at night. I never skip taking a shower. I have to wash my face every morning and night. The one step in my beauty regime that I never skip is to moisturize! I never skip using an SPF lotion every day to protect my skin from the sun. I have always taken care of my skin but I don't think I have found my "holy grail" products yet. I wash my face every morning and night (and moisturize of course). I feel like I need to figure out something that works best with my skin.... We shall see. The one thing I do not skip is putting on sunscreen on my face each morning! :) This product looks perfect--will have to check it out. I always take off my makeup before going to bed. Always wash my face in morning and evening and put on lotion before going to bed so my skin stays hydrated. I never skip out on moisturizing. Thanks for the nice giveaway! My best tip for healthy looking skin is to cut way down on the make up, use sunblock, a great moisturizer and drink a lot of water. I never skip the moisturizer step. I never skip taking my makeup off or applying eye cream! Using a daily SPF moisturizer is the most important to me. I will never skip cleansing. Thanks for the giveaway! Cleansing is one step in my beauty regimen that I never skip. I never skip drinking lots of water! I never skip removing my makeup at night! I never, ever skip cleansing my face. I never skip washing with my sonaluse brush. Love it! One step in my beauty regimen that I never skip is wearing SPF when I'm going out in the sun. Thanks for the giveaway! I never skip cleansing and using a good quality moisturizer with SPF. I exfoliate weekly too. Most days, all I get done is moisturizing. Moisturizer! I have dry skin, always have and if I don’t apply lotion after washing within a couple minutes, my face starts getting taut and super dry. I use moisturizer every day. I always remove my makeup at night. My uneven skin can use this product. I never skip moisturizer in the morning and night. I never skip eye creme or moisturizer with sunscreen. I wear moisturizer with sunscreen all year round. I never ever go to bed without washing my face. No matter how exhausted I am ! I never skip moisturizing my face daily. I never skip staying hydrated as I drink 5 - 6 glasses of water daily. I do skip moisturizing on occasion. I never skip using a sunscreen with moisturizer. I nerever skip moisturizing my skin so it doesnt look as dull! 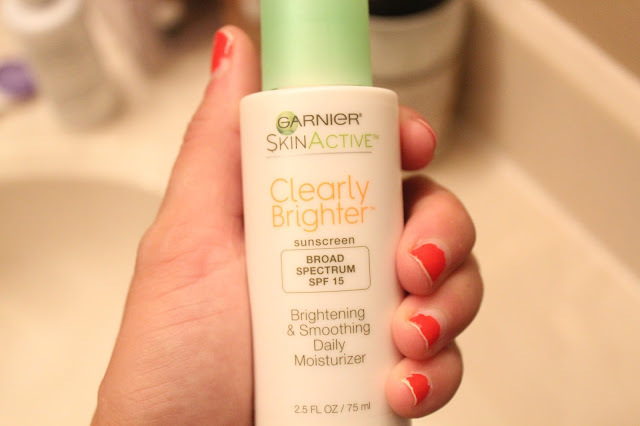 I have used the Garnier's Clearly Brighter Brightening and Smoothing Daily Moisturizer in the morning, and it makes me look like I've gotten a full night's sleep even if I only got a couple hours! I can only imagine how good this is! I try to moisturize my skin daily, as it definitely helps. I skip things all the time if I'm tired or feeling lazy to tell you the truth. No matter how tired I am, I NEVER skip washing my face every night! I never skip using a moisturizer with SPF! I never skip applying sunscreen when I'm going outside. i never skip the sunscreen. it is a must for me. i live in florida and i have very fair skin. I never skip taking off my make up at night. I will never stop moisturizing. I wash and moisturize my face every night. I never skip my moisturizer. One step in my beauty regime that I never skip is drinking lots of water every day. I have a refillable Brita pitcher that I keep on my nightstand and I make sure to drink a full one of those each day. I never skip the moisturizer in my routine. I cannot wait to try this product! I never skip moisturizing my skin because the air is so dry where I live. I never not take off my make p at night. I never skip the SPF, I don't want to damage my skin! I never skip putting on moisturizer with sunscreen. Every day. I would never skip exfoliating and moisturizer. My wife never skips using moisturizing lotion everyday. I never skip moisturizing my skin. My best skincare tip is to get plenty of sleep and drink lots of water. Always have water within reach. The one step in your beauty regimen that I never skip is to wash my skin with Garnier products. I never skip washing my face in the morning. It feels so good to wake up and start the day with a freshly washed face!